Over 60 years of being there for anyone who needs someone. 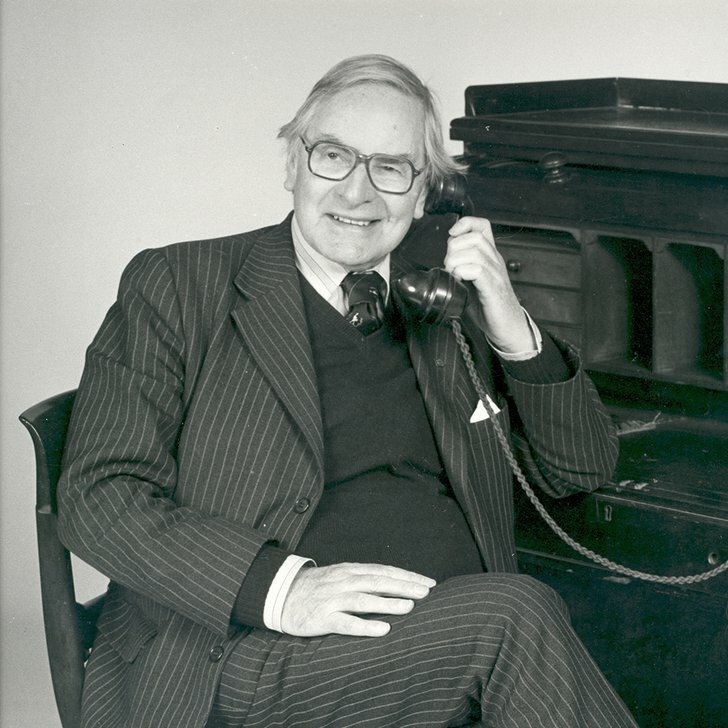 Although not a religious organisation, Samaritans was founded by a vicar called Chad Varah, in 1953 in London. Throughout his career Chad had offered counselling to his parishioners, and wanted to do something more specific to help people contemplating suicide. On 2nd November 1953, Chad Varah, a vicar and writer-cartoonist, answered the first ever call to a brand new helpline for people contemplating suicide. But back then, Samaritans was a far cry from the organisation of 20,000 volunteers it is now. In Chad’s own words, the service was just 'a man willing to listen, with a base and an emergency telephone'. In an emergency the citizen turns to the telephone and dials 999. There ought to be an emergency number for suicidal people, I thought. For many years, Chad would work all day and stay up until 2am or 3am writing scripts and cartoons to make ends meet. In his own words, his church stipend was only enough to pay Vivan Prosser, his secretary . But, in the summer of 1953, Chad was offered charge of the parish of St Stephen in the City of London, a post which gave him the time he needed to launch what he called a '999 for the suicidal'. On 2nd November 1953, with Vivan's help, Chad started taking calls. This date is recognised as Samaritans' official birthday. Chad knew the service would only work if people knew about it. Luckily, his work writing and illustrating articles for children's comics meant he had contacts at many national newspapers. In December 1953, just a month after launching, the Daily Mirror coined the phrase, 'Telephone Good Samaritan'. Although Samaritans is not a religious organisation, the name stuck and word spread far and wide. Chad and Vivan received calls from people who needed support on the phone and face to face, and from many, many people who wanted to volunteer. It soon became evident that the volunteers were doing the clients more good than I was. At first, Chad was skeptical of these volunteers. He let them sit with people as they waited for a counselling appointment with Chad. But often people would pour out their problems to volunteers and many felt no need to speak to Chad afterwards. The power of volunteers – to listen, confidentially and without judgement – turned out to be the real strength of the service. In February 1954, Chad officially handed over the task of supporting the callers to volunteers, and Samaritans as we know it today was born. When Samaritans first launched it was a London-based service. But the publicity created a lot of interest elsewhere in the UK. Several more Samaritans centres were set up in the following years – the second being Samaritans in Edinburgh, which took its first call on 1st June 1959. Today, we have over 20,000 volunteers and 201 branches across the UK and Republic of Ireland. And every six seconds, a Samaritan responds to a call for help. Our 24-hour listening service has come to be what Chad first envisioned – and more. In 2017, we reached more than half a million people through our work in local communities. And we’re working in schools, prisons, hospitals and communities, and have a long-running partnership with Network Rail to reduce suicides on the railways. The challenge now is to look to the future. As the way people choose to communicate changes over time, we need to continue to evolve, combining technology with compassion, to reach people who still so desperately need our help. As the world changes, we're to investing in new technologies to make sure we can reach the people who need us. For example, we’re developing an Instant Messaging service, for callers who prefer to contact us in that way, and have established groundbreaking partnerships with Google and Facebook.